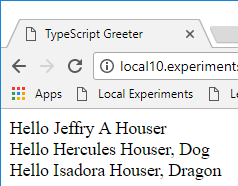 This is the last in my series of articles intended to introduce you to Typescript. It is bonus material I wrote for my Angular 4 book. This is the last part of the series. Check out part 1, part 2, Part 3, Part 4, Part 5. and Part 6, and Part 7. When writing a real-world application, it does not make sense to include all the code in a single file. TypeScript supports that by allowing you to expand different functionality into modules. This looks exactly like the Interface created in the previous exception with the one addition of the export keyword. Export tells the compiler that this class is available for use inside other classes. The import statement tells you that the name entity is imported from the IName file and can be used within this class. The path I used, './IName', tells us that the files are in the same directory, however we can use a more elaborate package setup, and most likely you will do that for main applications. This code mirrors the Person module, with the primary changes being the use of the export keyword before the class definition and the import of the name interface. The functionality remains unchanged. Like the previous classes it uses an export statement to make the class available elsewhere, and an import statement to make use of the name interface. The changes here was, primarily, removing the class and interface definitions and replacing them with imports. Congratulations! This series should have given you all the information you need to know to start using TypeScript to build your applications. Check out our book on Angular 4 which uses TypeScript heavily.